I grew up in a small village in which everybody knew everybody. People often had nicknames, which helped identify the right person. Nicknames are also common in tribal cultures (eg, native American Indians). Nicknames often give a physical description (eg, eyes, nose, old, short, strong, tall) or relate to certain achievements. The criminal world still uses similar nicknames. Identity is (very) important to humans. Perhaps this relates to the limbic brain that stores emotions and memories (#2 being). See yesterday's blog. Perhaps Who (am I) and What (am I) are important as the Why (am I here) is often a mystery to us. Our use of social media (eg, Facebook, LinkedIn) is nothing more than the expression of How we (want to) see our identity. I think, feel and believe that urbanization (my blogs) has been the main disruptor of our identities for thousands of years. The earliest cities, Çatalhöyük and Jericho, date back to the eighth millennium BC (8000BC-7000BC). Throughout history, we have found new ways to stress our identity. For thousands of years, clothing, colours and sexuality defined our identities. Urbanization, globalization and the Technological Revolution of 1800-2100 have all contributed to our wealth. We display our wealth - and thus our successful identity - through buying assets, like automobiles, brands, clothing, houses, and soon robots. Our identities seem to follow the Needs-Wants-Beliefs stages of our lives (my blogs). 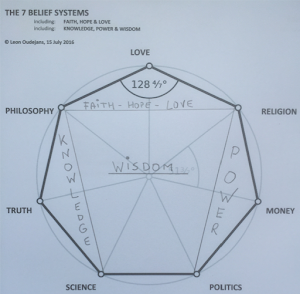 The 7 Belief systems (being: Love, Money, Philosophy, Politics, Religion, Science, and the Truth) govern our contemporary lives. Thus it makes perfect sense that (outer) identities follow (inner) beliefs. A more common name for this projection onto others is stereotyping. Wiki: "In social psychology, a stereotype is any thought widely adopted about specific types of individuals or certain ways of behaving intended to represent the entire group of those individuals or behaviors as a whole." For about 2500 years, antisemitism is a result of stereotyping (my 2016 blog). More recently, we refer to racial profiling rather than stereotyping. The result is the same: outer identities follow inner beliefs (eg, black criminal, Muslim terrorist, White Male Supremacist). Since about 2000, social media like Facebook and LinkedIn have enabled us to create our own online identity profiles, in which we tweak how we want (others) to see ourselves. To some extent, we are now stereotyping ourselves: Speaking as a White Male by David Brooks (NYT). David Brooks: "But the notion that group membership determines opinion undermines all that. If it’s just group against group, deliberation is a sham, beliefs are just masks [that] groups use to preserve power structures, and democracy is a fraud. The epistemological foundation of our system is in surprisingly radical flux."